Inventech Maine Solutions — builders of Life Proof Boats in Bremerton, Wash. — has delivered a 40’x12′ whale watching tour boat to Western Prince Cruises/Orca Whale Watch, Friday Harbor, Wash. The Subchapter T vessel has been approved for commercial coastwise service carrying 26 passengers and two crew. It is propelled by a pair of Hamiltonjet HJ292 waterjets which are powered by twin Cummins QSB 6.7 480-hp diesel engines with ZF 280 transmissions. Capacities include 275 gals. of diesel fuel and 20 gals. of fresh water. Scantling, keel bar and plating was calculated using Lloyd’s G2 service area requirements. During stability on-water tests, testing was considered with 200 lbs. per person simulated to cover any future increase in the Coast Guard’s recognized weight per passenger. The configuration of passengers seated, standing or moving to one side, passed the requirements with additional safety margins. Western Prince Cruises came to Life Proof Boats for the newest addition to its fleet because they felt the boatbuilder was the best fit for this business model, Life Proof said. After understanding more about Western Prince’s operations, Life Proof drafted a conceptual model for the center console layout. IMS designs and engineers all of its vessels in house. The new whale watcher is based on the family of Life Proof Boats 22° deadrise all 5086 aluminum construction monohull with closed cell foam collars. Final lightship weight was recorded as 15,330 lbs. During builders trials the vessel’s top speed was 43.6 knots with ¾ fuel and water, and five persons on board. During trials, which simulated a max weight load, the vessel recorded a cruise speed of 33.5 knots, burning a combined 35.4 gph, giving the vessel a 7.7 hours/258 nm range at cruising speed. The electronics package includes a Simrad GPS/depth/radar, Standard Horizon VHF and Fusion stereo with a hydrophone connection to give clients the experience of listening to the underwater songs of whales singing. The console is set above the engine room giving crew maximum visibility with limited obstructions to seek out the waters of the San Juan Islands’ marine life. To assist with an unbalanced load, the vessel is fitted with a Zipwake automatic trim control system. The bow is configured with in-deck storage and a manual lowering drop-bow with a fold four-step ladder for beach landing. Customers can enjoy 4″ thick cushions with durable black and red seats. Each seated position has storage inside the box, and forward facing seats include mesh pockets for storing small items during the journey. There is also a onboard fresh water plumbed flushing head in the forward trunk of the center console. 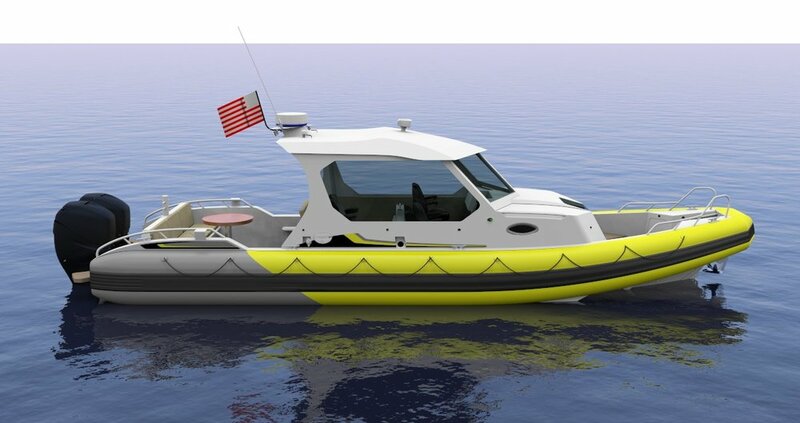 In addition, the vessel carries automatic fire suppression, a brass “shark bell” warning bell, a 30-person IBA, multiple water-tight compartments and foam collars with additional buoyancy foam within the engine room and hull voids.